NORTH LAS VEGAS, Nev. (AP) — A man was shot and killed Tuesday on the campus of a high school in North Las Vegas, Nevada, police said. 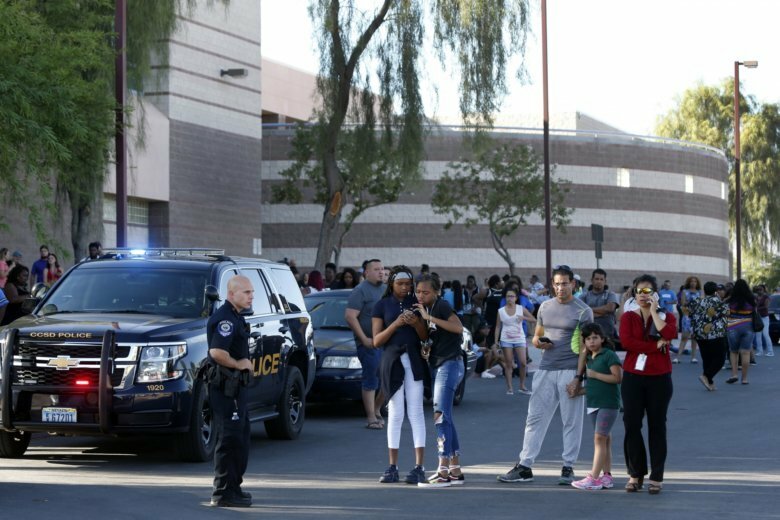 Authorities were working to determine if the 18-year-old victim was a student at Canyon Springs High School, North Las Vegas police spokesman Eric Leavitt said. The shooting happened around 2:40 p.m., when fewer than 500 students participating in athletics and after-school activities were still present at the school. Acting Police Chief Justin Roberts said the man was found shot on the edge of the school’s baseball field, but he would not release details about how he was shot or number of shots. The man, whose name has not been released by authorities, was taken to a hospital, where he was pronounced dead. Authorities had not identified a suspect as of Tuesday evening and were interviewing between 40 and 50 students as they worked to determine who shot the man, Leavitt said. The school went into lockdown immediately after the shooting. Police searched classrooms and hallways and gathered the students at a school gymnasium, but found no other wounded, Leavitt said. Several hundred people called 911 to report the shooting at the school that serves more than 2,700 students and is surrounded by homes, Leavitt said. The school is part of the Clark County School District, which includes schools in Las Vegas and Henderson. In November 2015, an after-school shooting near Mohave High School in North Las Vegas killed a student, 16-year-old Taylor Brantley, during a street-corner brawl that police said involved more than 40 people. Police said at the time it was not clear if Brantley had been involved in the fight.